Luxurious accomodations with 360 degree view ! Villa Cenote del Mar, this sought after luxurious beachfront villa rental has earned its reputation thanks to its prime location on the white sandy beach in Tankah Bay, situated 9 miles south of Akumal. Step inside the main entrance foyer and savor the sight of the great Room, featuring an elegant living room to the left and a large area to the right, dedicated to a spacious dining room and a gourmet kitchen. Villa Cenote del Mar’s kitchen is fully equipped and has stainless steel appliances, granite countertops and breakfast bar ideal for family or friends entertainment while you sip your favorite wine. Luxury custom made furnishings add to the atmosphere of luxury, exclusivity and relaxation that Villa Cenote del Mar is known for. Enjoy a luxurious vacation with ocean views; the east great room wall features expansive glass sliders opening the villa to the views of the pool and the white-sand Tankah Beach. Five out of six bedrooms feature views of the pool and beach and also open up onto either a shade pool patio in the lower level or onto the upper level ocean-side furnished terrace. The rooftop bedroom suite features a lounge area and a 360° panoramic view of Tankah Bay, from the beach to the jungle. Guests of the Villa Cenote del Mar can also relax by the pool and beach area, set up with spa-like lounge chairs, sofas, hammocks, a shade palapa, an outdoor kitchen and barbeque area. 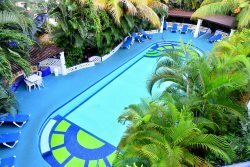 The Villa guest house located right next to the main villa consists of one lower and one upper level bedroom suite. Each suite feels more like an apartment perfect for up to 4 people and comes with a king-size bed and a double bed, an en-suite bathroom, a private kitchenette area, a separate terrace or patio and a private walkway to the pool and beach. 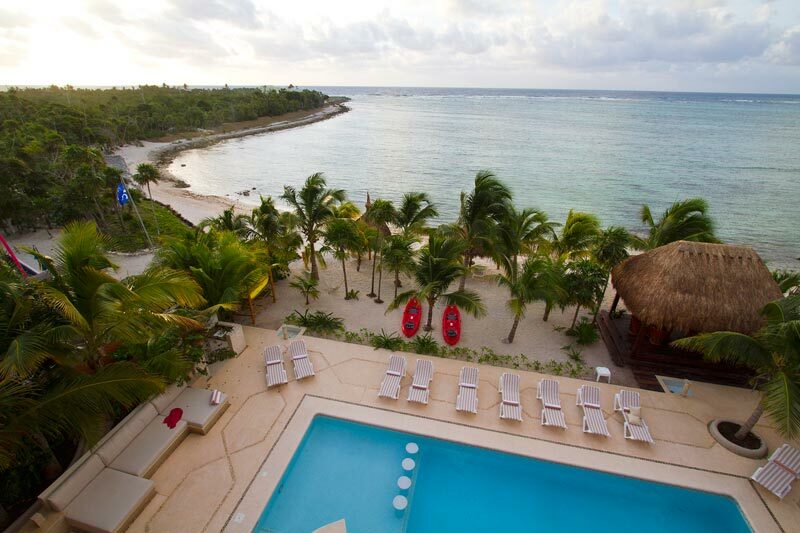 Embrace the luxuries and tranquility of Villa Cenote del Mar, the villa can accommodate up to 20 guest. Near by Casa Cenote there is a dive center, a couple of nice restaurants, and a small convenience store. One of the attractions of Tankah Bay is the Cenote which is a fresh water sinkhole. It rises to the surface on the west side of the road before traveling back through the underground cave system and re-emerging in the ocean in front of the Casa Cenote Restaurant. The large blue "Ojo" where the water flows into the sea is visible from the beach. Casa Cenote and Tankah Tres Bay are both excellent places to swim, scuba, and snorkel.